In the tropical rainforests of South-East Asia grows a tropical fruit that is practically unknown in the West: the mangosteen (Garcinia Mangostana). Thanks to its exclusive taste and beneficial properties, it received the title “Queen of fruits”! 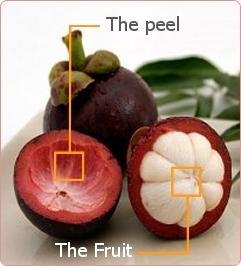 Most of us don’t know the mangosteen fruit at all! It is a tropical fruit which is already described in 17-de the century. Even Chinese writings from the era of the Ming dynasty are mentioning the beneficial properties of the mangosteen fruit! Up on today the mangosteen is used in the tropics of Southeast Asia for its beneficial properties. Having originated in Southeast Asia, the whole mangosteen fruit has been revered for its taste, but also for its nutritional properties. Historically, the whole fruit was used to treat people both topically and internally. This was done by either grinding the rind down and applying it directly to the skin or steeping it in water overnight and then drinking the resulting mangosteen tea. The mangosteen’s dark purple pericarp was actually used traditionally in Southeast Asia to maintain both internal and external health. The fruit is called after the French priest and researcher Laurentiers Garcin (1673-1751); So the scientific name is Garcinia Mangostana. Nowadays these fruit trees grow on commercial plantations in Thailand, India, Malaysia and the Philippines. Only in Malaysia the mangosteen trees grow in the wild. Garcinia Mangostana belongs to the family of Guttiferae, along with about 800 different other plants. Two relatives of the mangosteen are the Hypericum Perforatum (Saint John's Wort) and Garcinia Cambogia, which are already known as medical plants. It is highly astonishing that the mangosteen (absolutely no affinity with the mango) has never been used for it's beneficial properties in Europe or in North-America. Until recently, it has been one of the best kept mysteries of Mother Nature. The white, ropy fruit pulp has an excellent taste and the fruit is called for this reason the “Queen of Fruits” or “Fruit or the gods”. The taste is fresh and sweet like of a combination of strawberries and grapes. The tropical pulp melts on your tongue. But the people in southeast Asia appreciated the mangosteen especially for its beneficial advantages. Mangosteen, manggis or mangistan is a berry for the size of a tangerine and weighs 80 up to 140 grams. The fruit has been surrounded by a smooth, dark purple peel, which protects the snow-white fruit inside. It's possible that you find 2 up to 3 well developed seeds in the pulp; 1.3 up to 2.5 cm length. The mangosteen, manggis or mangistan. At the top a stem wit 4 cup shaped leaves and at the bottom 4 up to 8 stamp parts. The quantity of stamp parts is equal to the number of fruit parts inside. In Indonesia a fruit with 4 stamp parts brings luck, just like a clover with four leaves. Inside you will find bright white fruitparts, sticking together just like a mandarin. The magosteen tree only grows in tropical areas, although it is one of slowest growing trees; it's possible that an adult tree can grow up to 25 meters high. As from the moment that the seed has been planted, the tree needs 7 up to 10 years to mature and to produce fruit. Fully grown the tree can produce thousands of mangosteens each harvest. In spite of the fact that the mangosteen has been available on the Asian markets for centuries, it has never been commercialized in its whole form and brought to the Western population. The mangosteen is imported the whole year in small quantities out of Southeast Asia and Latin America and here available in the months February/May. The fruit is rich in lime, phosphorus, potassium and vitamin C.
Despite the fact that the mangosteen has been available, on the fruit markets of South-East Asia, for centuries, it has never really been known in the Western market. Partly because of the limited shelf-life of this tender fruit, a fast transport to the West is necessary and that was simply not possible in the 17-the century. But now it can and the mangosteen is imported from South-East Asia, in small quantities and is available in the months of February/May. Discover the power of the mangosteen. Order XANGO®Juice with our ordering form! The mangosteen fruit is rich in potassium, phosphorus, lime and vitamin C, but most of all, it is rich in xanthones. Those xanthones are capable to neutralize free radicals and therefore capable of protecting your body and supporting your health.